Sing for the Climate is a major singing manifestation that first took place on September 22 and 23, 2012 in Belgium. Over 80,000 people in more than 180 Belgian cities and communities sang the song “Do it Now”, urging politicians to take Climate Breakdown seriously and to do far more than they are currently doing. The campaign asked political leaders to urgently implement critical and ambitious climate measures on the local, national and international level. The video below is a synthesis of recordings that were made from all 180 Belgian locations. The success of ‘Sing for the Climate’ proves that a mass mobilization around climate change is still possible. 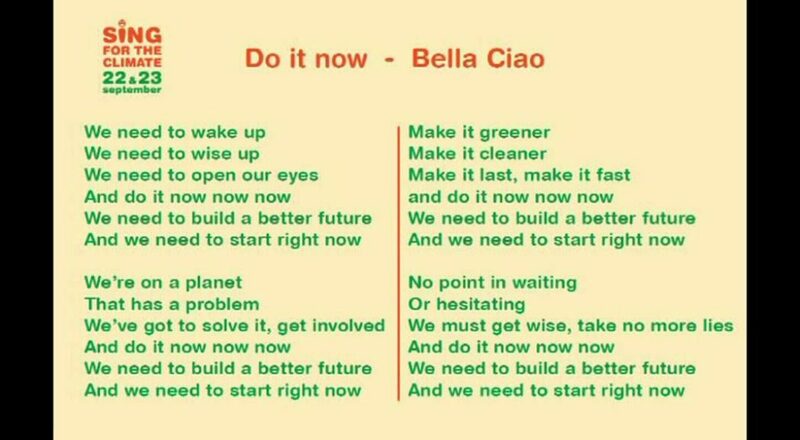 Following our young peoples Climate Strike on March 15, 2019, inspired by Greta Thunberg, perhaps we can help the Belgian organisers to now make this song the Global anthem of our young peoples Climate Action Movement. Belgium and Ireland are small countries and climate change is a global problem, which needs to be tackled on an international level. Therefore the Belgian people are appealing to local groups and organizations worldwide to organize their own version of Sing for the Climate. More information, tools and support for local actions can be found on by clicking here. Sing for the Climate is the culmination of three years campaigning for ‘The Big Ask’. Learn all about this story in the video which can be accessed by clicking here.